At BAUMGARTEN, we have a large fleet of machinery with a clamping force varying from 50 to 350 tons. These machines are equipped with high quality peripherals to optimize both the work of our operators and the transformation process. BAUMGARTEN mould workshop is provided by our own maintenance department, whereas our R & D office designs and develops tools that will be used in the manufacturing of new products. We also offer the possibility of final products, since we perform assemblies and finishing operations. 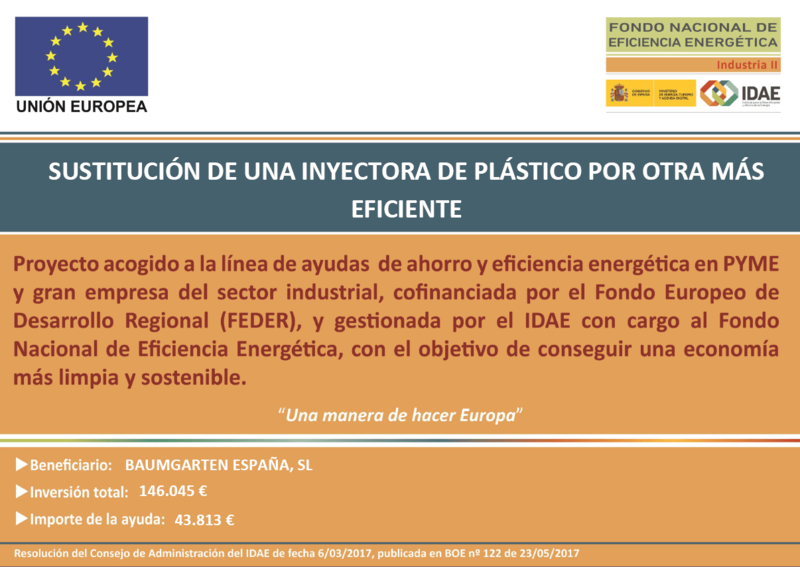 BAUMGARTEN Spain, S. L. has carried out the implementation of an energy saving and efficiency project with the financial support of the Institute for Energy Diversification and Saving (IDAE). This project, which goal is to replace a plastic injection moulding machine with a more efficient one, is supported by the line of energy saving and efficiency aids in SMEs and large companies in the industrial sector. It is co-financed by the European Regional Development Fund (ERDF) and managed by the IDAE under the National Energy Efficiency Fund and aims at achieving a cleaner and more sustainable economy.